Windscreen wipers for a motorcycle helmet: Modeled after the Speich Clear view screen, sold for marine use. The Speich costs about $2800. This cost me nothing (a few components from the parts bin). Why ? Motorcycles have fantastic visibility in good weather. Riding through a forest in autumn or on a mountain road you see everything, unconstrained by the letterbox of a car windscreen (often with insect smears and smudges where the wipers don't reach). A good pair of safety glasses or a visor is hardly visible when your eyes are focused on "far", so there is essentially nothing between you and the scenery. All that changes in bad weather, very much for the worse. Rain on a visor is OK, sort of - you can look between the drops - until headlights come towards you. Then you see bright star patterns from light diffracted through the drops. Wiping a plastic visor clear is risky, since any road grit will scratch the surface. (rinsing with running water is safe, but not practical while riding ...). How it works: Raindrops falling on the spinning disk are flung off at high speed by centrifugal force, keeping the disk clear. Although the disk only covers a small portion of the visor, the rider can bob their head around to look through the clear section at an object of interest, such as a suicidal pedestrian in dark clothing. The photo shows only one battery (1.5V). It works better with two batteries (3V). The acrylic disk was cut from spare material I had used to make the visor (the helmet is a motocross model that doesn't come with one). I traced around a cup with a felt tip, then cut carefully with kitchen scissors. The motor is stuck to the visor with sticky fixers (double-sided adhesive foam). The disk is glued to the pulley on the motor shaft with cyanoacrylate cement ("superglue"). It must be dead center or it will vibrate and maybe break loose. In the prototype, the wires are soldered directly to the batteries, which are fastened to the peak with cable ties. The switch is a panel-mount type fastened through a hole drilled in the peak. Loose wires are secured with electricians tape. I don't normally use the helmet peak, but it offered a convenient place to mount the batteries and switch, and stops rain getting on the visor behind the disk when stationary. 8 November 2008 - got to try it in the rain at night. Not so good. The 2 layers of plastic (visor and disk) makes 4 surfaces for dirt/grease/spray/fog thus doubling the diffraction effects. 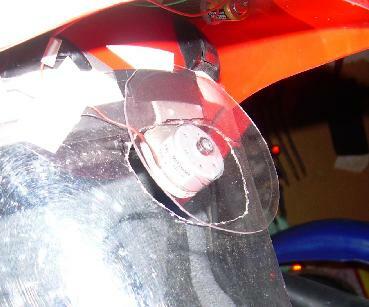 So now I have cut a hole in the visor and set the disk nearer to it, with a slight overlap. Later - the glass doesn't work so well. (a) it's heavy, and causes the disk to slip on the motor spindle and eventually fall off. (b) it's really hard to laminate it evenly on to the plastic, at least using resin, which makes for a blurring effect when spinning (even if the resin is even and smooth, with just a linear difference in thickness across the disk that is unnoticable when stationary). So basically it fell off and broke and I didn't replace it. Maybe a very thin glass slide professionally laminated would work. The glass store I spoke to didn't have anything like that. One problem is getting the disk evenly centered on the motor. With the glass I had marked the centre, then traced the outline with a pair of compasses, so I knew where the centre was. Then I glued the disk to the motor spindle and aligned it by eye. However, if it isn't quite right there is some vibration when it spins, and I was worried it might work loose again. Finally I hit on the obvious - glue the disk first, then mark a circle with a pen while it is spinning, then cut around the circle. Mk 2 with hole in visor.